On Wednesday, defense lawyers representing the six officers charged with the death of Freddie Gray argued that the trial had to be as far removed from the city and sentiment of Baltimore as possible. THOMAS HEDGES, TRNN: Welcome to the Real News Network. My name is Thomas Hedges. We’re outside of the Baltimore Circuit Court where today the first pre-trial hearing took case in the case of Freddie Gray. 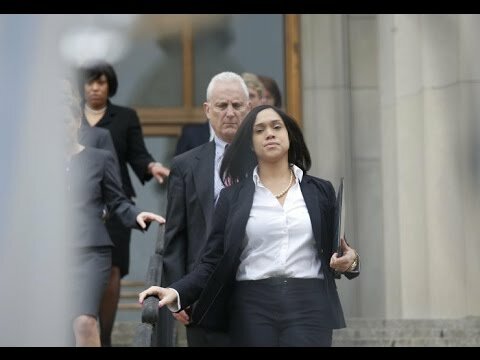 The defense for the six officers who are charged in the killing of Freddie Gray have filed three motions to try and change the case, or the conditions surrounding the case, in such a way that it would be advantageous to them. Two of them, those motions today, were rejected by Judge Williams. We spoke to Lawrence Grandpre, who’s the research director over at Leaders of a Beautiful Struggle. He was also present at the hearing. He says that what the defense is trying to do right now is attack every aspect of the case before the trial actually begins. LAWRENCE GRANDPRE: The defense of the police is linked to the Fraternal Order of Police, the police union. And the statements that they filed, the motions that they filed, the language they filed, they have I think as a researcher a skewed notion of objectivity and bias. They basically think that the people in Baltimore are inherently going to seek to convict cops. So the police are trying to control the rhetorical and literal ground upon which this trial is going to be fought with the change of venue, but also the way they are shaping the discourse. And [inaud.] most of the people in the city are very adamant that you need to have a contextual obligation of what policing is and what policing in the city has historically been to make an actually informed decision as to whether what happened with Freddie Gray, whether [inaud.] or not, we’re not seeking the so-called lynch mob, which is their rhetoric. We’re seeking an actual contextual engagement with the reality of a massive power imbalance between police and citizens. And therefore we need to have legal interventions like this trial to address that power imbalance. But of course the police union’s especially seeking to protect their union people, the cops call that bias. HEDGES: And so another option is, another question is whether it’s going to be a judge trial or a jury trial. Explain what the difference is and then why that’s significant. GRANDPRE: Well, obviously the jury trial would be, goes through a jury selection process in terms of having a jury selection process where both sides could vet people they think are willing to, quote, “be objective” about this issue. But unfortunately many people are questioning this notion of objectivity. Because the idea that you don’t have an opinion over something so egregious as police brutality would be perceived itself to potentially be a bias. So the very nature of jury selection, especially if it’s also [inaud.] to stay in Baltimore will produce a jury that perhaps doesn’t have actual context to evaluate the issue actually fairly. HEDGES: Right. Thanks so much for joining us, Lawrence. And thanks for joining on the Real News.